Wedding November 17, 2018 "Sundance, One Of The Best Decisions We Made!" Jim, Angie, & The rest of The Band Sundance were absolutely phenomenal! They were SO quick to respond to us each and every time we had a question or concern. They even learned some new songs for our Father-Daughter dance, Mother-Son dance, and for our first dance as a married couple! They sounded fantastic too! I can't tell you how many people approached us during and after the wedding and commented on how amazing Sundance was and how they really enjoyed the music, the interaction, and all the fun the band brought to the evening! They interacted with us, our bridal party (even working them into some songs! ), and with the guests, which really made for a special evening for us and our guests. They were always polite, on time, and incredibly professional! To top it off, Angie even captured much of the ceremony, toasts, and reception for us on camera/video, so we have even more memories than what the photographer could capture on his own! Having the Band Sundance play at our wedding was one of the best decisions we made planning our wedding! Wedding October 27, 2018 "Our Perfect Day!" We loved everything about this band! They had our dance floor packed the entire night and everyone LOVED when they brought us (bride and groom) onto the stage to help them sing and play instruments. One of the best parts was that they videoed our dance floor, all of the important dances, and the speeches! We would recommend The Band Sundance to anyone who asked. Thank you so much for being part of our perfect day! Wedding May 18, 2018 "The Band Sundance did an amazing job"
The band Sundance did an amazing job at our wedding! I would definitely recommend them to anyone looking for a band for their wedding! From the beginning, the leader of the band, Jim, was so easy to work with! From learning new songs that we wanted played at our wedding to even capturing photos/videos after our photographer left, he made sure it was taken care of! They sounded amazing and had all of our guest up on their feet the whole night!!! Wedding June 6, 2018 "Live music is the way to go"
Wedding February 10, 2018 "You won't find a better group of musicians"
The Band Sundance comes highly recommended from me. The value added they provide includes; video service, emcee service, willing to learn new songs and the ability to really get the party started. You won't find a better group of musicians. Their sound is the best. There is nothing like going from Bruno Mars to Chicago with the Sundance Horns. Vocals are the best with Jody and Angela fronting the band but then you include the guys singing and it's unbelievable. Jim is great to work with and is really accommodating to make your day even more special. Wedding November 11, 2017 "Put on an amazing show"
Do not have enough words to express how great the Band Sundance was for our wedding. Their ease of communication beforehand put both of us at ease that we would not have to worry about this vendor. The bands choice of songs kept everyone of all age groups on the dance floor. We received numerous compliments of the band. Whether it was when they were playing, or when they catered to other music the crowd liked when they were on break. Their professionalism, talent, and love of getting people out on the dance floor is second to none. I wish we could have had more time with the Band Sundance, and would recommend them to anyone looking to have a live band. Whether it was 70s-90s music or country music, the Band Sundace put on an amazing show. Also the fact they took candid photos while playing was something that went above and beyond what you woould expect of a band. Again, there are not enough words to express how great they were at our wedding. Wedding October 28, 2017 "The Band Sundance was absolutely incredible." The Band Sundance was absolutely incredible. They were such a blast! Every guest loved the music and felt like they were at a live concert. High energy, great quality, and totally made our wedding. They were great to work with and helped make the planning process much easier!! Would highly highly recommend this band! Groom stated: "Just want to let you know that we got the flash drive and just spent the last two hours looking at the photos and watching the videos. That was so great of you guys to get all that and send it to us. Thanks again for a great night. Everyone we've been talking to has been raving about you guys." Wedding October 8, 2016 "This band is terrific"
This band is terrific! They ran everything from the moment the evening started, right up to the last song! Jim Rallis did all the entrance announcements for the bridal party, and made each individual person feel special! We were able to set up our own song list and they performed each song perfectly! Very professional, and absolutely a blast to party with. There was never any down time, when the band took a break, Jim turned into a DJ and the floor never emptied! This was a very special night for my daughter and l, the band set it up for me to surprise my daughter during the father daughter dance by having me sing our special song to her with a wireless mic, we will never forget that moment! The band is very easy to work with, they performed special requests, allowed several of our guests to sing and play with the band, and had the bride and groom up on stage singing and hammering away on the cowbell! They made our night very personal as if they were part of the family. Angie also took pictures and videos from the stage that were unbelievable, this was something our photographer wasn't able to get, and a totally different perspective! If your looking for a band that can do it all, this is it! Wedding October 8, 2016 "I recommend this band"
Sundance did an amazing job at our wedding! They had no issues learning some of the songs that we wanted to be played and our reception was perfect thanks to them. We received so many compliments on how much fun our wedding was after the event and I believe that was mostly because of Sundance and how they were able to engage the crowd throughout the whole evening. I would definitely recommend them! Wedding October 15, 2016 "They are incredible"
We absolutely loved having The Band Sundance play at our wedding! They played for over 4 hours and kept the dance floor packed all night! They had such high energy and are fantastic musicians, and the fun they had on stage was infectious! They offered a personalized playlist of hundreds of songs and we loved everything they played! They even learned a new song for our first dance and it was incredible! It was so easy working with them and they were consummate professionals! They even brought us on stage at one point to play with them, and we had such a blast! They also took their own pictures and videos and provided them to us at no extra charge! We had such a wonderful experience working with The Band Sundance, and we would recommend them to everyone! Wedding October 7, 2017 "Best Night Ever"
"We did a lot of research to find the best band for our wedding. After getting pricey quotes back from orchestra-type bands, a friend recommended Sundance. She had attended another wedding with Sundance and had a blast on the dance floor. We went to one of Sundance's show, met the band and quickly decided Sundance would be the best fit for us. Sundance can plan a wide variety of songs and kept our crowd (ranging from teenagers to grandparents) entertained. They were able to play all of our first dance song requests and sent us their playlist in advance so we could choose songs we liked and didn't like. By the middle of the night, we were up front playing the cowbell and tambourine with the band. Everyone loved seeing the bride and groom having fun with the band! We received many compliments about the band and how much fun people had dancing. After the wedding we received a flashdrive full of photos and videos - lots of fun dancing photos! 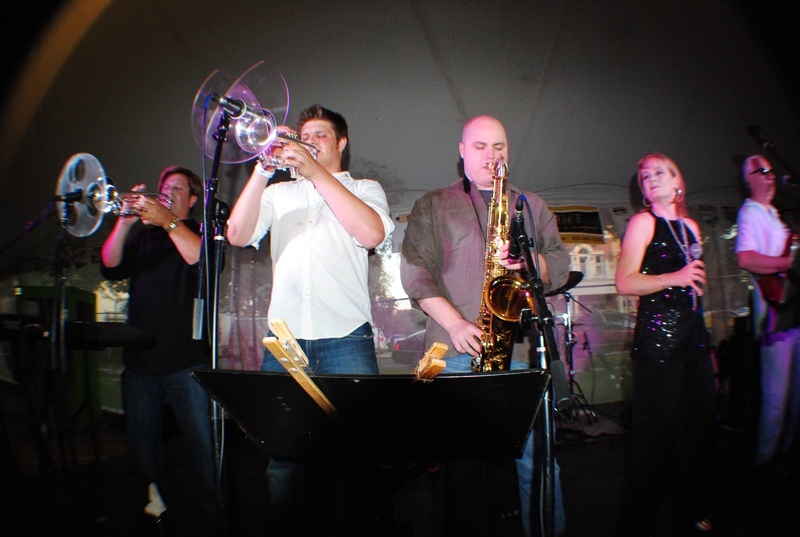 Jim and Angela are easy to work with and lead a lively and fun band that we were so glad could play at our wedding." Wedding November 11, 2017 "Thank you Sundance"
The Band Sundance was amazing. Everone enjoyed their music and their energy. I am still getting compliments from the wedding guests. They were easy to work with and very professional. Would hire them again they made the wedding an event to remember. THANK YOU SUNDANCE!!!! Wedding 8/26/17 "Book the Band Sundance Now"
We would recommend this band to anyone looking for a something to set their party apart from others. Our guests from ages 30 to 70 commented on what a great band. The kids all had a blast on the dance floor and playing along on the triangle/tambourine. Jim was amazing to work with and accommodated our every request. The horns section really got people's attention and gave extra dimension to the sound! Book The Band Sundance now! Wedding 8/4/17 "You won't be disappointed"
I highly recommend The Band Sundance! We received so many compliments about them. They are a lot of fun and keep the party going. They even learned our first dance song which made it extra special. They were very responsive throughout the whole process and prompt on our wedding day. You won’t be disappointed!! Wedding Date 8/6/17 "BOOK THEM NOW!" BOOK THEM NOW! The Band Sundance was an absolute joy to have at our wedding! From our initial conversations, I had nothing but positive and helpful communications with Jim and the band. They provided the music during the ceremony for us, and kicked it right off during cocktail hour and for the rest of the evening. The high energy, great sound, and amazing song selections kept everyone on the floor throughout the night. Our friends and family had only positive things to say about the music. They are an amazing value, and as an 8 Piece Band, they really get the party going! I highly recommend The Band Sundance for your event! We truly loved having The Band Sundance play our wedding. They kept the party going the entire evening and night and played songs that so many could enjoy. If you are looking for an excellent band and have an invite list of really fun people, then know they will not disappoint. Our family and friends asked us to do it again the following weekend because they had so much fun. Thanks Sundance!! Wedding 5/28/17 "We could not be happier"
The Band Sundance was amazing! We could not be happier with our choice for a wedding band! They are great muscians who know how to keep the party going. The dance floor was PACKED all night long. In fact, when the music stopped at midnight, everyone was still standing on the dance floor-no one even moved to leave! I highly recommend this band for your next event! Wedding 4/28/17 "They were amazing"
We booked this band for our wedding reception and they were amazing. All of our guests had a blast and gave a lot of compliments specifically about the band. They play a good variety of songs and are super fun. We would recommend them to anyone looking to book a wedding band! Wedding Date 8/27/16 "Dollar for Dollar"
Wedding July 23, 2016 "Great band and Great Value"
The Band Sundance played at my wedding and made the night! Everyone raved about the music and the band had everyone up dancing the whole night!! Jim is great to work with and kept me calm the whole night knowing the reception was going to be awesome. Great band and great value!! Wedding Date 10/11/14 "WOW! BOOK THIS BAND! You'll need a bigger dance floor! Holy cow! My wife and I have seen Sundance perform now at three weddings (two family friends and now our own wedding). The first decision we made regarding our wedding was not a date or a venue, but rather that we HAD to have this band! They play a wide variety of music from your typical dinner music to the classic rock n' roll and current pop. From day one our communication with Jim, the band leader, was fantastic. We didn't have easy requests either...my father-in-law is a big Rolling Stones fan and his request was to have a Stones song for the Father/Daughter dance. They learned it and even performed several other Stones songs throughout the night that they had learned! The band showed up early and was ready before guests began arriving to the reception. The band took 1-2 short breaks but during the breaks had DJ music to make sure no one left the dance floor. The dance floor was packed all night long! My cousin grabbed the mic and sang "Don't Stop Believin'" with the band and my uncle joined in on the jaw-harp for some "Sweet Home Chicago" to end the night! Having a band at your wedding will cost you a few more green-backs than having a DJ. But lets be honest, who remembers the food, booze, or decor? No one! But everyone remembers whether they were dancing all night and having a great time. You'll get that and more with Sundance. Wedding September 24, 2016 "Packed dance floor the entire night"
This band was perfect! They played everything I wanted to hear and offer a specialized playlist and DJ if there are songs they might not know. The dance floor was packed all night and they were very engaging with all the guests. They had our guests and us get on stage and play instruments and sing with the band - everyone had so much fun with it. I would highly recommend this band and I got so many compliments on how the band made it one of the best weddings guests had ever attended. They also take pictures and videos from the bands view, which was an unexpected, but amazing surprise! Wedding Date 4/09/2016 "All I can say is WOW! All I can say is WOW. The Sundance Band made our wedding one of the most fun, memorable nights of our lives! The band played songs that got the young, old, and "I-don't-dance" people out on the dance floor all night. I was worried that there would be too many people outside on the veranda instead of on the dance floor, but this was never an issue. It was a pleasure working with Jim, the manager and emcee. The band played specific live songs we wanted for our Mother/Son and Father/Daughter dance. Also, last minute, they were able to play a blues song for our intros that made our wedding party intros fun and unique. It was seamless discussing the details with Jim up until the big day, and his calm demeanor really helped ease our worries. Wedding Date 8/1/15 "Best Wedding Band"
Wedding Date 12/28/2009 "Sundance Rocks!!" Wedding Date 4/4/15 "They made our wedding special"
Wedding Date 8/9/2014 "Awesome Band - Rocked Our Wedding!" Wedding Date 9/19/2005 The Band Sundance - "Brought the Sun Indoors!" Wedding Date 7/19/2014 "Band Sundance Made Our Wedding Awesome!" Wedding Date 9/7/2014 "Sundance at Our Wedding Last Year!" Sundance was amazing! Can't recommend highly enough- had all our guests on the dance floor and were easy to work with on getting song requests ready beforehand and in getting needed equipment, etc. They played music that appealed to all ages and were interactive, getting several people up on stage. I'm told continuously after our wedding how great the band was and how much fun the party was. They even learned the song for my father-daughter dance! Wedding Date 9/5/2010 "Best Live Band Out There!" From the start to the finish, the band was completely involved in the mixture of ages and types of people, playing songs that were appropriate for all. All of our guests had a wonderful time and packed the dance floor, leaving only when requested. The band even went above and beyond to try and help us lower the volume of the hall next to ours. They have since played at 4 weddings of our closest friends and family and been amazing at all venues. They take song requests at will and if you want them to play something specific for your reception, just ask them ahead of time and they will learn it! Wedding Date 11/2/13 "Unforgetable Party!" Wedding Date 6/22/13 "Fantastic Wedding Band!" Wedding Date 6/21/2008 "Fantastic Band!!!!" Wedding Date 8/9/214 "Wedding Band - The Band Sundance AWESOME!" The Band Sundance was absolutely fantastic!!! When planning our wedding I initially thought that having a DJ was the way to go because of the cost and selection of music. I was mistaken! Out of all the things we spent money on, the Band Sundance made the most impact!!! They truly energized the entire evening. They met with us prior to the event and ensured they had an understanding of what we wanted, accommodated all of our special requests and truly personalized all aspects of their performance. They even let my new husband sign a love song to me! All of our guests, young, old and especially the teens and twenties commented on how wonderful they were. They were all out on the dance floor and loving it! They also had guests interact with the band at an appropriate level to keep the crowd involved. They covered a wide variety of genres which was a delight for all of our 200 guests young and old.Those guests who were skeptical when we told them we were having a band changed their minds in a hurry and danced the night away. They energize and ignite a wedding party! I am so happy we decided to have them entertain! I have only positive things to say! I would highly recommend them to anyone for their wedding reception or any other event! Wedding Date 10/13/2013 "What a GREAT Choice!" Wedding Date 10/10/2003 "One Amazing Wedding Band!!" We had the amazing pleasure of having Sundance play at our wedding. The dance floor was packed the whole night. There were no lulls of no people on the floor like you get at most weddings. As a matter of fact guest were offering to chip in to get the venue to let us stay later because they were enjoying the music so much! They played all the songs we requested and were my favorite vendor to deal with. We are still getting compliments on our choice of having THIS band play at our wedding! As a matter of fact when my husband and I have the opportunity to go out for the night we try to plan it around where the band is playing. Wedding Dates 2/6/2009 & 10/10/2003 "GREAT Band for Every Occasion!!" Wedding Date 6/21/2009 "The Bandsundance"
Wedding Date 9/7/2013 "The Band Sundance For Our Wedding"
Wedding Date 11/27/1992 "If you want the best, hire Sundance!!" I received so many compliments about the band! They played all the hits and many standards for the older crowd too. The dance floor was packed all night. They are very versatile and their music selection is second to none. They were so great to work with and I would hire them over and over again! Outstanding group of professional musicians, great showmanship and lots of fun. Even people from the wedding next door at the banquet hall were standing by the door enjoying the band! Everybody loved them!! Best night of my life and the music was the most memorable portion of the evening! Thanks Sundance...you are awesome!!! Wedding Date 6/20/15 "This band made our day"
Everything about the band was great. We were all very pleased and would recommend them to anyone. In addition to playing at the dinner reception at Brookfield Zoo, a saxophonist performed during the cocktail hour at the bear enclosure and it made that part of the wedding celebraion even more interesting. Wedding Date 4/4/15 "Sundance rocked it"
Sundance was professional and willing to make the wedding night the way we wanted it. I would, without hesitation recommend this band to anyone, for any venue. Wedding Date 1/16/16 "This Band ROCKED!" This band ROCKED! A big part of our wedding budget went to live music and it was worth every penny. Not only was the band reasonable but they absolutely made the wedding. If we had just gone with a DJ it would not have been the big party that occurred. The floor was packed the entire time with people dancing whenever they played. My mom said she didn't remember the last time she danced so much. They even got some of our attendants and myself involved in playing along. Great group of people, book them and you will not be disappointed in your special day!